A few weeks ago I wrote a piece about the Labour leadership election and about the future direction of our Party. It set out the reasons why I believe the qualities that Yvette Cooper would have brought to the position of Leader made her the candidate for me to support. The scale of Jeremy Corbyn’s victory was, however, overwhelming and it must be respected. I don’t say that grudgingly. Hundreds of thousands of people have signed up to Labour and there has been an energy around his campaign which has touched people who have been turned off from involvement in conventional parties in recent years. As I also said in the piece I wrote in August, that presents a real opportunity for Labour. Seizing that opportunity presents two big challenges for Labour. First, to face up to the kind of charges in policy and political direction that can apply our principles to world that we face over the next twenty years, not those of either the last twenty years or the twenty before that. Second, it is to change the style and character of our politics so it can reach out in ways that which both Jeremy’s campaign and a range of movements beyond conventional parties have given us a glimpse. A word too about my friend and West Midlands colleague, Tom Watson. His victory in the Deputy Leadership contest was also overwhelming. He is a tireless campaigner who has shown he is up to facing the challenges above. Tom has made clear he will be a loyal Deputy in an inclusive and forward-looking Party. Both Jeremy and Tom have my support in that. So the deadline has now passed for people to register as Labour supporters to have a vote in the Labour Leadership election. Amid stories of malign infiltration by some Tories and others, Labour is right to check the genuineness of applications before ballot papers are issued. But let’s be clear, the fact that thousands of new people feel motivated to join the debate about the future of Labour is a good thing, particularly when so many of them are young people who have never been part of a mainstream political party before. It’s also good that a lot of those joining are prepared to challenge orthodoxies along the way – from the wisdom of replacing Trident to some of the economic assumptions that have been associated with the word “austerity”. Those of us who have been around for decades can agree or disagree with these challenges but either way our arguments are going to have to relate to the world as it is today. It isn’t going to cut much ice for us to sagely shake our heads and tell people to remember the 1980s when most of the people we are telling were barely born then. People are telling us that the world has moved on. That it is us, not them who have failed to move with it. That it is us who are not listening. That the old definitions of left and right don’t work anymore. The problem is, of course, that in the world beyond the Labour Leadership contest people have signalled their disaffection in different and contradictory ways. Up and down the country, thousands of people who would never claim to identify with either the performance or outlook of Cameron and Osborne nevertheless chose to stick with “the devil they know” than opt for the change they thought Labour represented. Millions of others chose to express their estrangement from the entire political establishment by voting for the cocktail of anger and blame that characterised the message of UKIP; by voting Green or, in the 2015 landslide north of the Border, to assert their identity via the medium of the SNP. At least they all voted. Despite being predicted at the time to be the most closely fought contest for years, nearly 30,000 people in my constituency did not feel sufficiently engaged by the world of politics to vote at all. That’s about forty per cent of the electorate. And Birmingham Northfield was far from the only constituency to experience that kind of abstention rate. Facing the future means redefining what the role of a mainstream party of the left is in an age when people are turned off by party politics. Reaching out to them requires us to project a vision not of how society could have been different in the last decade but why it can be different in the next one. That means a politics which recognises and responds to how the world of work is changing and about the impact this has on life at home. We need to think far more creatively about how a permanent revolution in communications technology can transform not only the ways we talk together but even the new choices we are able to make about how people and goods can move around locally, nationally and internationally. And because a global and connected world can bring inequality, conflict and environmental degradation just as easily as advancement, we must show how a politics of social solidarity will be the best cornerstone of opportunity in the years to come, rather than something caricatured as the enemy. And we must show that none of this is the stuff of dreams. It’s about demonstrating how the choices which governments make affect not only the life chances of the people we ask to vote for us but also the cohesion of the world in which we all live. The sheer scale of these questions require a radically different approach to the way we do our politics, just as much as it means crafting the policies which illustrate the vision we seek to project. That is a task for all of us. It goes well beyond who we choose as Leader in just over a month. Seeing the Leadership contest as a kind of political MasterChef competition where we all cheer on our favourite policy recipes from either old left or “New Labour” right may provide each of us with comfort food at a difficult time. But it won’t deliver the goods. This however, does not make our choice of who should lead us any less important. We cannot simply vacate our role as a credible Parliamentary opposition while we chart our long term path to the future. We failed to do that in the months following the 2010 election, allowing the Conservatives/Lib Dem coalition the space to establish itself and to plant in the minds of the public an image of the previous Labour Government’s economic record that was at odds with the facts. So this time there must be no more delay in taking the fight to the Tories. We need a Leader who has credibility from day one, not only as Leader of the Opposition but someone who the public can see as a future Prime Minister. For me that candidate is Yvette Cooper. You can see it in the way she has used the platform of her Leadership campaign, not only to talk about the future of Labour, but also to call out the Conservative Government on issues ranging from their attack on Trade Union rights to the ways they are already serially breaking their election promises. The calm authority with which she has taken on Theresa May as Home Secretary, meanwhile, underlines that she can take on David Cameron and George Osborne in the coming years and come out on top. But credibility is not simply about public performance. It’s about having confidence in where our politics come from. The ability to distinguish the strategic from the tactical comes from being clear about our values. Yvette’s refusal to cede ground to the Tories over the causes of the 2008/9 financial crash illustrates that clarity. So too has been her refusal to join an arms race of rhetoric in response to the situation at Calais, and her insistence that only an internationalist approach can stand any chance of addressing the long term causes of mass migration. 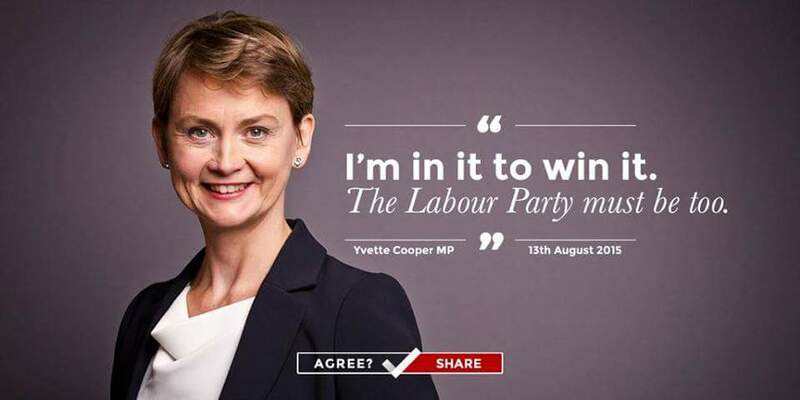 Yvette is also someone who understands the importance of collective responsibility. I have never been someone who blindly follows the Party line. Indeed my refusal to do so from Iraq to Tuition Fees probably helped keep me on the back benches throughout the entire Blair and Brown years. Sometimes it is right to make a stand even against your own side. In a healthy democracy backbenchers must always retain the capacity to say no to those in authority. The days of command and control by Party Leaders have gone and that’s a good thing. But for a Party to be effective in Parliament and trusted outside, unity which is rooted in collective responsibility is crucial too. And that is where Leadership comes in. An effective Leader has to personally embody a sense of collective responsibility if he or she is also going to promote it to others. I am not backing Yvette because I think her election will itself answer the big challenges that Labour faces in building a majority for progressive politics in this country. If we believe in the politics that make us Labour, we must know that this cannot be down to any individual. I am backing Yvette because I believe she is the candidate who best understands the role of Leadership – someone willing to move on from old arguments but who does not lose sight of our values as a Party. And while I do not suggest that gender should be the deal breaker when it comes to this election, the fact remains that Labour has never yet elected a woman leader. So if not now, then when? Support Labour? Then register to vote for Labour’s next leader. We know that politics has to change. That means more than the Labour Party changing. But we can do our bit. And that is why this time not only will every individual Labour member have a vote, but people who support our Party will have a say too. I will be voting for Yvette Cooper to be Leader and Tom Watson as Deputy. But the votes of MPs like me will count for the same as those of everyone else. Every Labour member and supporter will however be able to vote for the leadership team we each want. For more information about all the candidates, including blog posts, recordings of their debates – as well as guidance on how to sign up to become a registered supporter to a full member, from as little as £3 – visit the Labour Leadership FAQs page. Just over two weeks ago, Labour members and supporters -old and new – met at the Factory Youth Centre in Longbridge to discuss our victory in Birmingham Northfield, our defeat nationally and the challenges and opportunities facing Labour over the coming five years. Workshops were on themes ranging from low pay to housing; from children and young people to the economy and the role of the private sector. Reports from the workshops are being written up and will help inform both Labour’s work in South west Birmingham and our contribution to policy making nationally.